This movie is unbelievable! As we grow old, some movies just aren’t as good as when we first watched them. “The Goonies” is a great example of this, watch it again and you’ll see it was better in the past. 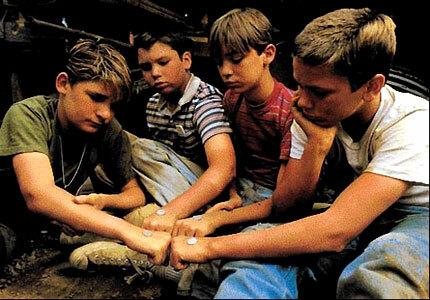 This is not the case with “Stand by Me”; the movie’s nostalgic aspects only keep building every time we watch it, to a crescendo that never comes. It’s very difficult to make the banal interesting. A story of a motley crew of teenagers who get detention and spend a Saturday afternoon together sounds more like the storyline to a dogma 95 movie than a Hollywood blockbuster. That’s one of the many reasons you grace this list with your presence, “The Breakfast Club”. One of those Coming of Age movies to watch with a female friend or loved one! As a youngster, my life was full of awkward moments. Sometimes looking back I think it was just a montage of them. This coming of age movie encompasses all those moments in one movie. It’s a brilliant film to watch with friends, you will love it! You haven’t seen this, I bet! It has subtitles and yet it’s Canadian but it’s great. Very funny, easy to watch, clever, sincere, emotional and all round fun. One of those great coming of age movies! Great soundtrack, which some might argue carries the film immensely. I liked it, especially when he’s on the roof of the house and says “I’m on drugs” before jumping into the pool. Wes Anderson is a great director…no questions and while this film is no “Royal Tenenbaums”, what is? What about that moment when Bill Murray sinks to the bottom of the pool with a cigarette still in his mouth. Quirky, plus where else can you see a play version of Serpico? When she walks up with the flowers in her hand at the end, we all shed a few tears. And why wouldn’t we? We’re not monsters and he’s gone forever… at least where he’s gone, Michael Jackson can’t touch him any more! Few people know that the story of Jim Carroll’s life is available in song form by no other than the man himself, Jim Carroll. Besides the song being great, the move is pretty good; especially as every other movie on this list is pretty middle class besides, “A Bronx’s Tale” and this …. Probably says something about me but f*ck it! of Ubisoft’s favorite flavors: the stealth of Splinter Cell, the platforming of Assassin’s Creed and Prince of Persia, and a blending of all three in regards to combat. At one point, we also found the city’s gladiatorial arena. Yes! Finally something about knobz. A game villain should be rotten enougfh that the player generates genuine passion and satisfaction from defeating hiim or her.